Here’s the thing with pretty much every Most Valuable, Most Outstanding, Most Whatever-You-Want-To-Call-It Player award: Winning it doesn’t necessarily mean you were the best player, or that you definitely had the best season. All it really means is that the voting panel (usually the media) liked you and really liked your performance. It’s no more subjective of an honor than an Oscar, a Grammy or a figure-skating gold medal. Still, a good MVP argument is almost always irresistible, precisely because it’s all subjective and because we all bring our biases to the table. In the Barclays Premier League, a trio of candidates appears to be pulling away in the Player of the Year race: Liverpool striker Luis Suarez, Chelsea wing Eden Hazard, and Manchester City midfielder Yaya Toure. 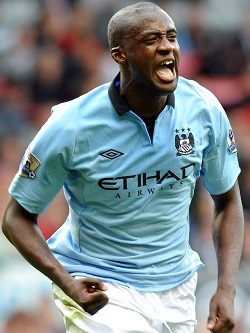 Retired soccer star Patrick Vieira, a World Cup winner with France and seven-time league champion between the Premier League (England) and Serie A (Italy), believes Toure deserves the nod in 2014. In American football terms, Toure — a Muslim from the Ivory Coast — doesn’t just put up big numbers like Tony Romo; he comes up big in his team’s biggest games like Tom Brady.